Clayton grew up in Edmond and attended Edmond Memorial High School. Upon graduation, Clayton attended the University of Oklahoma. In 2006 he graduated with a Bachelor of Business in Entrepreneurship and Venture Management. After graduation, he then began his insurance career at the agency his grandfather opened in in 1957. 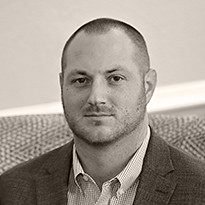 Clayton joined Rich & Cartmill in January of 2018, and continues to specialize in commercial insurance and bonds for the construction industry. Clayton is also active in many construction associations. Clayton and his wife, Mary, live in Edmond with their two children, Betty and Coleman.